The previous post on Cozi’s updated family calendar reminded me to point out a small but interesting aspect of the Cozi calendar UI that’s worked out rather well. As it turns out, the UI in question is in the Settings area of the product—an area where interesting design opportunities are often overlooked in the haste to get that peripheral stuff out of the way so one can get back to designing core features. 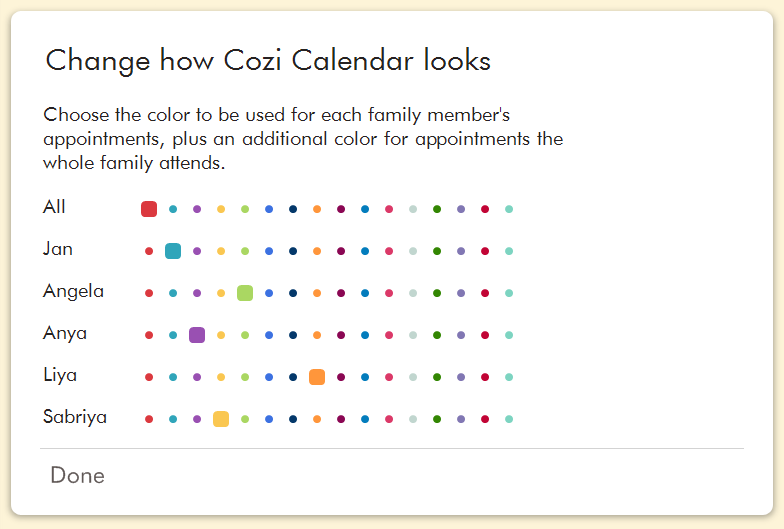 During Cozi's early family research, we met parents who liked to color-code calendar entries according to the person or people involved in the appointment. 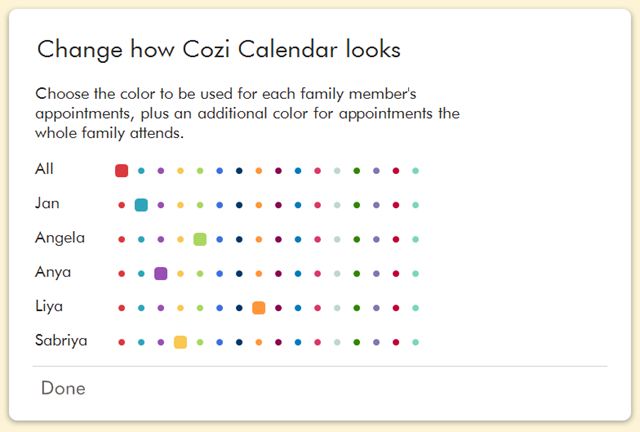 Accordingly, Cozi lets families color-code appointments in the calendar. (Color is used as a shorthand; it’s not the only way of seeing who an appointment is for, so color blind users need not worry.) Cozi picks a color for each family member by default, but since color is a highly emotional element, we wanted to offer a way to let family members choose their own color. The available colors should all be attractive and work well with the overall Cozi color palette. The UI should ensure each family member ends up with a unique color for each family member, otherwise the family won’t be able to tell whose appointments are whose when scanning the colors. The colors need to cover a sufficiently broad range that each family member can get a color they like. The palette from which colors are chosen shouldn’t contain colors that are too similar. If one family member chooses dark blue and another a slightly darker blue, they’ll never be able to tell them apart. It shouldn’t be hard for a family to collectively choose a set of colors that all work well together. This is a challenging design constraint: once you’ve got about 6 colors in a palette, your choices for each additional color are either going to start running close to your existing colors, or else create the potential for ugly combinations. Some applications like Microsoft PowerPoint have a sophisticated color model to help people create reasonably attractive combinations of colors. (Alas, they still can’t prevent the determined user from creating something hideous.) We didn’t have the capacity to develop such a model, and needed something simpler. A family should be able to have some fun picking the colors. 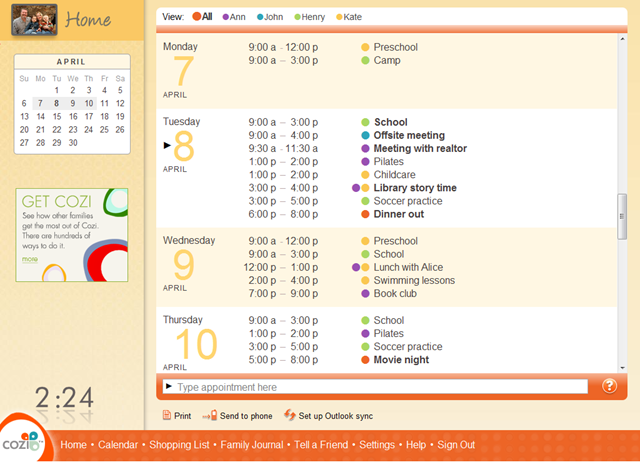 One wrinkle in using a design like this for our calendar settings UI was created by requirement #3 above: the need for unique color mappings. This is an instance of a cross-field validation rule: the validity of one field value may depend upon another. In a UI like the one above, it’s hard to come up with a good design to communicate cross-field validation rules without confusing or irritating the user. Suppose the colors must be unique, and the user wants to swap the colors in field A and field B. They try to change B’s value to the value in A, but the field complains that B's value duplicates A's value—and forces the user to fix field B before they can leave it. This is terrible! They’re forced to clear B (or assign some temporary value to B), go to A, change it, and come back and enter the desired value in B. One solution is to leave such cross-field validation rules until the user tries to commit the whole form. Alternately, you can deliver the feedback about the need for uniqueness modelessly. The problem with either solution is that the user ends up being surprised: just at the point they think they’re done, they have to go back and rethink their entries. You can try to let them know the uniqueness requirement up front via instructional text, but most users aren’t going to read it, so you’d probably just spend some screen real estate for nothing. The immediate advantages of this approach is that the user can see all the color choices at a glance, and they can make a choice with a single click (instead of having to spend one click revealing the dropdown palette, and another to make a selection). But the true benefit of this approach is that the user will infer the requirement for uniqueness without it needing to be enforced. In usability tests, we see users intuitively grasp that they should pick a color from any given column no more than once. They can work that out on an intellectual level, of course, but the UI makes that easier to see. With that in mind, we were able to relax the enforcement of unique color selections—the user takes care of that on their own. This lets us deal handily with situations like the need to swap color choices. And, finally, people seem to enjoy using the UI to pick colors. It's well understood that a dropdown control will generally be more compact than a set of radio buttons, but in situations where the same dropdown control is repeated across multiple rows, a grid of radio buttons can be efficient as well. 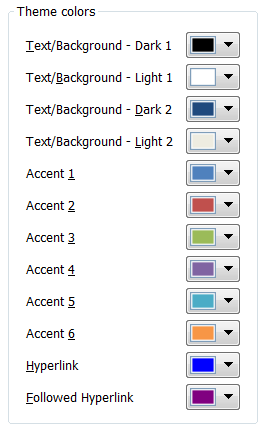 Each column only needs to be labeled once, so the individual radio buttons don't need their own labels. (The color swatches in the Cozi design are effectively self-descriptive radio buttons that don't even need column labels.) And though the repeated controls take up considerable space, they afford the user the ability to quickly apprehend relationships between field values. In the Cozi color UI, the user can spot-check whether each color has been used only once. And in the survey UI, the user can quickly perceive the balance of their responses across the range of choices. If you have a similar settings UI in your own product, perhaps with dropdown controls, consider whether the set of choices is small enough that you can display the complete range in a grid. It's been way too long since I was last able to post here, mostly because having three small children equates to having zero personal time. Still, work has been productive. Today Cozi posted an update to the web version of our family calendar. Our web calendar has long lagged behind the PC version, but we've been working hard to correct that, and today's release represents a big step towards that goal. Asynchronous loading of appointment data. We used to reload the entire page whenever we needed to display new calendar data (e.g., when adding an appointment). Now we just refresh the days we need to. Infinite scrolling. The old implementation would only let you see one week's worth of appointments at a time. Movement between weeks was generally managed with "Previous Week" and "Next Week" links. The new UI uses infinite scrolling, so the user can move as far into the future (or past) as they need to with just the scroll bar. This work dovetails with the aforementioned async loading of data. Complete typography overhaul. Improved margins and leading make it easier to visually parse the information into three vertical columns and a large horizontal row for each date. This included details like right-aligning the color-coded family member dots so that they are visually grouped with the appointment subject. For all we know zillions of other people have done the same thing, but we think this bending of the rules lets you produce a clean and highly legible timetable with plain HTML. Tuned the color of all text elements in the calendar data. Dates are shown in color, body text in gray. For contrast, the subjects of a non-routine appointment (something that doesn't happen weekly) are set in black to make them stand out—since those are the appointments a family needs to focus their attention on. Placed the day of the week over the date. Users of a family calendar are extremely interested in what's happening during the coming week, and much less so in what's happening months away. Placing the day of the week over the date reflects that priority. Tweaked the background color banding on alternate days to make it a bit more prominent. This is really hard to get right so that it's perceptible on all monitors, but not overpowering on monitors with excessive contrast. Revised the UI controls for selecting the family member whose calendar you want to look at. The old design had big tabs, which users immediately understand, but they occupied more space than was justified by their relatively infrequent use. We took the opportunity to more explicitly present the list of names as a legend for the color-coded dots. Added gradients to the colored bars at the top and bottom of the calendar. These are done as a series of one pixel-high DIVs so that we can easily swap out the gradient based on the current family member's color without needing to store a ton of images. Cleaned up element margins overall. Tightened borders around the natural language appointment entry area at the bottom. Shortened the hint text inside the text box. Although being able to double-click a day to create an appointment is a useful shortcut, users can find it on their own without instruction. In that same area, replaced the "What can I type?" link (which was spec'ed as white, but had ended up as black due to a bug) with a smaller question mark icon. Cleaned up the "Home" button script in the upper left. We'd previously used sIFR for this and other instances of "handwritten" text in the product. It's a nice bit of technology, but in this case the text was static, so using Flash was complete overkill. Now it's a simple transparent PNG (or a transparent PNG8 in IE 6.x). Cleaned up the mini-calendar on left. The mini-calendar now shows a minimal set of information and controls in its normal state (when the mouse isn't over it). This keeps the UI clean. 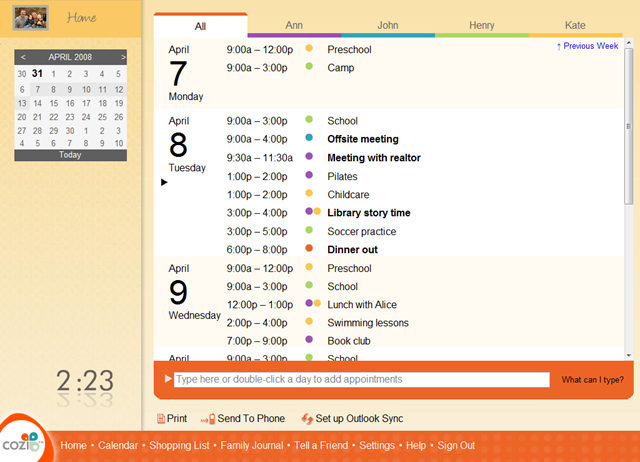 When the user moves the mouse over the mini-calendar, various navigation controls appear for navigation to the previous month, the next month, and today. In the rollover state, the mini-calendar also shows the dates at the end of the previous month and the dates at the beginning of the next month. This makes it quicker to navigate to dates just outside the current month. We've built this calendar by styling the jQuery UI date picker, which has worked well in practice. Added advertising in the left pane. Hey, we have to pay for all this work somehow! We've been careful to keep advertising separate from the family's calendar content on the right. Overall, we're quite happy with the result. We have more improvements to the Cozi calendar in the works, and are eager for those to see the light of day too.